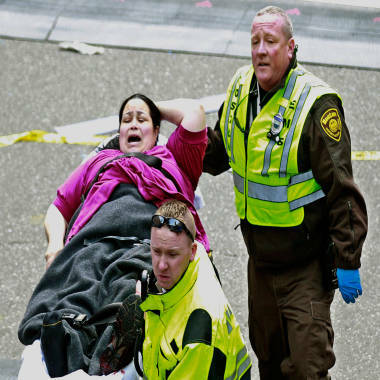 The FBI’s lead investigator into the Boston Marathon bombings on Tuesday made a passionate plea for information from the public, saying the “range of suspects and motives remains wide open” as the probe into who might be responsible for the attacks begins. 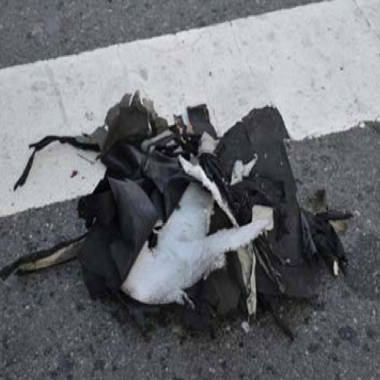 The remains of a black backpack that the FBI says contained one of the bombs that exploded during the Boston Marathon. DesLauriers told reporters in an afternoon briefing that the FBI has received more than 2,000 tips as of midday Tuesday, and investigators have already vetted some of those. In addition, many people and businesses have submitted photographs and video of the scene near the marathon’s finish line where the blasts occurred. Still, investigators have no firm suspects in the case and no groups or people have stepped forward to claim responsibility for the attack that killed three people and injured at least 176. Federal prosecutors are preparing a limited number of search warrants in the Boston area in their search for evidence in the bombing, a senior federal law enforcement official told NBC News. 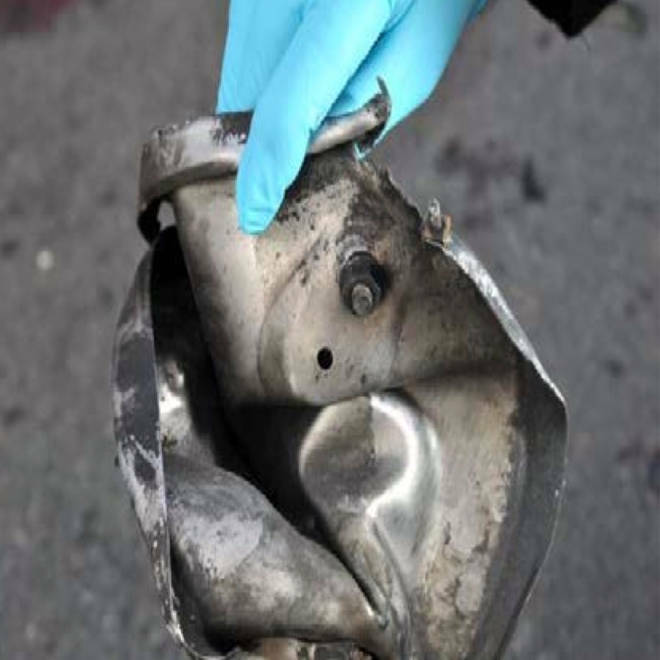 And, late Tuesday the FBI released photos showing contorted metal that it said were the remains of one of the pressure-cooker bombs used in the Boston Marathon attack. Agents are "weeding through" the evidence, the official said. But the searches do not indicate that agents have any hard leads right now into who was behind the bombing, the official said, adding that the number of search warrants are "less than a half dozen." More than a day after the bombs went off, crime scene processing continues with hundreds of hours of video simultaneously being viewed, a federal official said. At some point FBI behavioral profilers will join in the analysis, officials said, as they begin their effort to put together who the person or persons were who launched the attack. Investigators have begun the process of recovering tiny pieces of bombs to learn how they were made. So far, they know the bombs were made from pressure cookers filled with ball bearings and nails – a method used for decades in terror bombings. But no suspects are in custody and investigators are asking the public for help. NBC's Pete Williams reports. Investigators have found fragments of dark or black nylon, which were possibly from a bag or backpack that contained the bombs. In addition, pieces of what is believed to have been a pressure cooker used in making the bomb have been discovered. Those pieces of evidence, along with others, are being sent to the FBI’s lab in Quantico, Va., for testing to determine if they were indeed part of the bomb. The lab will attempt to reconstruct the explosive devices to determine their origin, DesLauriers said. "This is a painful and tragic lesson, but we will learn from this as well," said Massachusetts Gov. Deval Patrick. Patrick also announced that President Barack Obama would attend an interfaith service honoring the victims of the tragedy at 11 a.m. on Thursday at Cathedral of the Holy Cross in South Boston. Sources involved in the investigation said late Tuesday that the pressure-cooker bombs were powerful "homemade claymore," directional explosives that appeared to include a triggering mechanism using a battery pack and a circuit board. Both of those elements were recovered at the scene. "It appeared to be built from scratch but with a sophisticated triggering mechanism. And frankly, at the end of the day, all bombs are crude devices, and it is the way they are triggered that can be sophisticated," said one official with strong knowledge of explosives. "They functioned as designed." According to a FBI-Department of Homeland Security document, a preliminary examination of photographs and on-scene reports show that one of the bombs consisted of a pressure cooker with an undetermined main charge. The other device was also housed in a metal container, but so far there is not enough evidence to determine if it was also a pressure cooker, the document stated. The two Boston Marathon bombs appeared to have each contained tiny nails – smaller than the ones used to hang pictures, “fine nails” or brads, according to one of the people assigned to the case. And the devices themselves appear to have been delivered to the scene in two duffle bags. Nicholas Yanni, who sustained injuries during the explosion at the Boston Marathon, talks about the bombing at a news conference Tuesday. DesLauriers earlier vowed to go “to the ends of the earth” to find those responsible. But a day after the explosions, Obama said that authorities did not know whether the attack was foreign or domestic, the work of a group or an individual, or what the motive might be. According to federal officials, there is no indication currently of any overseas involvement or direction in the attacks, and although the case is being handled by the international terrorism section of the FBI, that is simply a matter of resources, and if it turns out to be domestic the command of the incident will simply be switched. Law enforcement officials told NBC News that the explosives were classified as low — meaning that they traveled at under 3,300 feet per second. That is not enough to create a blast wave, which can kill people from air compression and blow out faraway windows, but it is enough to propel shrapnel a great distance. A pressure cooker, in its everyday use, speeds cooking by creating a tight seal and building pressure inside the pot. Converting it to a bomb sheaths the explosives in a metal casing, which blows apart when the bomb is detonated and adds to the shrapnel already packed inside. Rep. Michael McCaul, R-Texas, chair of the House Homeland Security Committee, said that he knew of two ways to detonate a pressure cooker bomb — with a device placed on the cooker or by remote, such as by cellphone. Law enforcement could use records to track a cellphone detonation, he said. One of the three devices that was to be used in an attempted bomb attack in Times Square in 2010 was a pressure cooker. Earlier that year, terrorists used a pressure cooker bomb in an attack in Pakistan. And in 2006, more than 130 people were killed on the transit system of Mumbai, India, when pressure cookers loaded with explosives were placed on trains. In the hunt for clues in Boston, informal public efforts sprang up almost immediately to scour the mass of photos and video already posted on Twitter, Facebook and other sites. Authorities added their own call for help, hoping that in an era of ever-present smartphones, race fans might be holding evidence without even knowing it. From the White House, Obama praised acts of heroism after the explosions and said that the investigation would take time. Authorities confirmed at a mid-morning news conference that only two bombs went off Monday. Contradicting reports from the chaotic early hours after the blasts, they said that no unexploded devices were found. Overnight, law enforcement officials searched a suburban Boston apartment building, interviewed a man and removed a duffel bag and two trash bags. But a law enforcement official later told NBC News that nothing of interest was found. They also issued alerts for a rental van and a man seen leaving the scene of the blasts. Law enforcement officials also told NBC News that the bombs, which detonated seconds apart, were packed with ball bearings and BBs, apparently intended to increase the casualties. The blasts turned the finish line of the marathon into a hellish scene of panicked spectators, shattered glass and blood-spattered sidewalks. 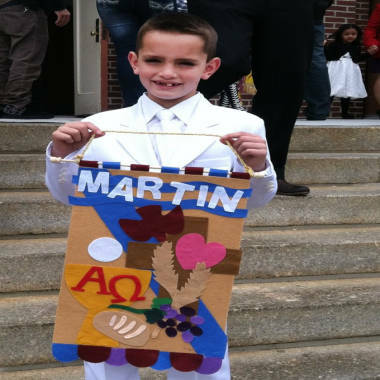 Martin Richard, 8, was killed in the marathon bombing. Among the dead was an 8-year-old Boston boy, Martin Richard, who was waiting at the finish. Krystle Campbell, 29, of the Boston suburb of Medford, was also killed, her father told NBC News. The Chinese consulate in New York said the third victim was a Chinese national. The victim, whose family has requested she not be identified, was also a student at Boston University, the school said. As of 3:30 p.m. ET, there were 72 patients from the blasts still being treated at six Boston hospitals, including some who had injuries described as “limb-threatening.” An official at Boston Children’s Hospital said the youngest victim was a 2-year-old boy with a head injury. Among the other injured were brothers, 33 and 31, who each lost a leg from the knee down. Dr. George Velmahos, chief of trauma at Massachusetts General Hospital, told reporters that surgeons had removed pellets, nails and other shrapnel from the bodies of patients. They bled heavily, and some required amputations, he said. Investigators were studying surveillance video to look for anyone placing packages at the points where the bombs exploded. Law enforcement officials said there was video showing a person, from the back, carrying two backpacks, but they said it was too soon to know whether that was related to the attack. The Boston police commissioner called the resulting crime scene the most complex that the department has ever dealt with, and said all sworn officers were working around the clock. The FBI took charge, but an array of law enforcement agencies joined the hunt. Leads poured in. Investigators picked through mounds of personal belongings left by some of the thousands of people who fled the finish line, at Boylston Street, after gathering for perhaps the most joyous day on the Boston calendar — Patriots Day. Authorities at all levels asked for patience. Sen. Dianne Feinstein, D-Calif., the chair of the Senate Intelligence Committee, said that she had great faith that an arrest would be made. NBC News chief justice correspondent Pete Williams discusses the latest on the Boston Marathon bombing, saying investigators spoke at length with a 20-year-old student yesterday, whose apartment was searched overnight. Public officials have repeatedly praised spectators, runners and race volunteers for charging in to help. One in particular gained online fame — a man named Carlos Arredondo who was pictured in a photo helping rush a gray-faced young man in a wheelchair to safety, pinching what appeared to be a protruding artery to stop the blood. Obama cited runners who had kept going after the race to get to hospitals, and people who tore off clothes to make tourniquets. Gov. Patrick and Boston Mayor Thomas Menino said a new centralized fund was set up in order to to gather donations to help families affected by the tragedy. Called The One Fund Boston, contributions can be made through a website, onefundboston.org. Firefighters spent the night chasing bomb scares around a jittery city, and the country was on edge on the day after the explosions. A terminal at LaGuardia Airport in New York, a plane in Boston and part of the Cleveland transit system were briefly cleared because of suspicious packages. Authorities in big cities increased security. A fire at the John F. Kennedy presidential library in Boston more than an hour after the blasts, initially treated by investigators as related, appeared be caused by a simple electrical short, police said. The blasts went off just before 3 p.m., with thousands of runners still on the course. They sent up white plumes of smoke, rattled police barricades and stiffened flags set up to celebrate the 96 countries that sent runners to the most prestigious road race. Boston Globe senior sports reporter Steve Silva was covering the Boston Marathon yesterday when he caught the explosions on tape, and finish line coordinator Tom Meagher ran to the aid of a fallen runner. The two men talk about the tragedy they witnessed. Law enforcement officials told NBC News that authorities questioned a 20-year-old man who is in the United States on a valid student visa. He was seen running from the blast area, had burns and was interviewed in a Boston hospital. But an official told NBC News that interest in the man was fading. It was his apartment building, in the Boston suburb of Revere, that police and federal agents searched overnight. The race drew 27,000 runners and has been run since 1897 on Patriots Day, the third Monday in April, which commemorates Lexington and Concord, the two battles in Massachusetts that started the American Revolution. The year, the race coincided with the filing deadline for federal taxes. Security experts said the FBI would undoubtedly look into the possible significance of the date as they tried to find the bomber and the motive. Michael Isikoff, Jeff Black, Jonathan Dienst and Michael Kosnar of NBC News contributed to this report. Who is the hero in the cowboy hat at the finish line?